We all know about social bookmarking site like Del.icio.us, you can use it to bookmark any website. Do you know Vi.sualize.us? It lets you bookmark your favorite photos and share them with other people online. 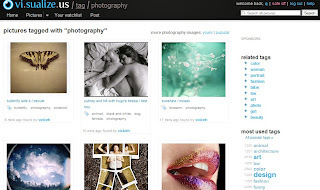 Like Del.icio.us, you can use tag to search photos in Vi.sualize.us. It offers a extension for Firefox that allows you to use right click on a photo to add it in you bookmark. After you registered, you can download this extension. It should add your favorite photos to your bookmark easier than before. If you like collect photos maybe that is good way for you.